There are various infections that can cause abdominal pain, some of which can be treated medically and some which are treated surgically. One relatively common issue that could be life-threatening in a long term survival situation, especially to young people, would be appendicitis. 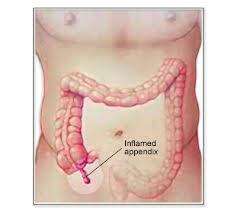 Appendicitis (inflammation of the appendix) occurs in approximately 8 out of every 100 people. Who is in Danger of Appendicitis? Appendicitis can occur in anyone but most likely affects people under 40. The appendix is a tubular worm-shaped piece of tissue 2-4 inches long which connects to the intestine at the lower right side of the abdomen. The inside of this structure forms a pouch that opens to the large intestine. The appendix was once an important organ and still is in some animals (for example, horses), but it is shrunken and nonfunctional in human beings. This is an example of a “vestigial” organ, which means that it exists but serves little useful purpose. The appendix causes trouble as a result of a blockage. This allows bacteria to multiply and cause inflammation, infection, and even fill up with pus. If the problem is not treated, the appendix can burst; this causes an infection called “peritonitis” which can spread throughout the entire abdomen and become very serious. Before the development of antibiotics, it was not unusual to die from the infection; one well-known victim was the silent film star Rudolph Valentino. Some believe that eating seeds is a cause of appendicitis as the seed may cause a blockage. 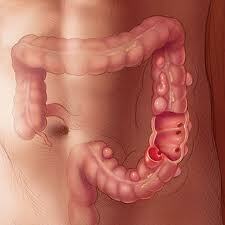 Others believe that a lack of fiber in the diet causes small bits of very hard stool to become lodged in the organ. Although these are (rare) possibilities, most cases have no obvious cause. Appendicitis starts off with vague discomfort in the area of the belly button, but moves down to the lower right quadrant of the abdomen after a period of time. A patient may resist using his legs, as that triggers movement of abdominal muscles. Nausea, vomiting, and fever are other common signs and symptoms you may see. In severe cases, abdominal swelling may occur. To diagnose this condition, press down on the lower right of the abdomen. It will be uncomfortable. Pressing on the left lower quadrant may elicit pain in the lower right, as well. A sign of a possible ruptured appendix may be what is called “rebound tenderness”. In this circumstance, pressing down will cause pain, but it will be even more painful when you remove your hand. The patient should be restricted to small amounts of clear liquids as soon as you make the diagnosis. Surgical removal of the appendix is curative here, but will be difficult to carry out without modern medical facilities. If modern surgical care is unavailable, consider giving the patient antibiotics in the hope of eliminating an early infection. A combination of Ciprofloxacin (FISH-FLOX) and Metronidazole (FISH-ZOLE) is an option and is also acceptable in those allergic to Penicillins. Recovery, although slow, may still be possible if treatment is begun early enough or the body has formed a wall around the infection. Can surgery be performed in situations where general anesthesia is unavailable? Most surgeries can’t, without the likelihood of losing a patient. Having said that, surgeons in third world countries have done appendectomies under local anesthesia (https://www.ncbi.nlm.nih.gov/pubmed/17563965). See the link below to see the procedure done on a completely awake patient. You will see the appendix pop out at about 3:50 into the video. In women of childbearing age, a tubal pregnancy should be ruled out. This is a condition that occurs in 1 in every 125 pregnancies. 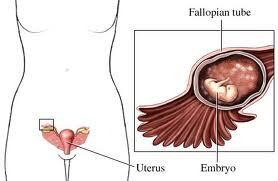 The embryo fails to implant in the uterine wall and implants in the Fallopian tube instead. In this case, the pain is due to the presence of blood instead of an infection. If you have women of childbearing age in your family or survival group, have some pregnancy tests in your medical supplies. A woman with a positive pregnancy test and severe pain on one side of the lower abdomen is a tubal pregnancy until proven otherwise. Diverticulitis may be seen mostly in older patients. Diverticula are small pouches in the large bowel that resemble an inner tube peeking out of a defect in an old-timey car tire. These areas may become blocked just like the appendix might. The symptoms are very similar, but most will complain of pain in the lower left quadrant instead of the right (see image below). A female pelvic infection caused by sexually transmitted diseases, such as gonorrhea or chlamydia, may imitate some of the symptoms of an inflamed appendix. This is known as Pelvic Inflammatory Disease. These patients will, however, usually have pain on both sides of the lower abdomen, associated with fever and, sometimes, foul vaginal discharge. Other inflammatory conditions in the bowel, such as Crohn’s Disease or Ulcerative Colitis, may present with pelvic pain, as could other female pelvic issues such as ovarian cysts. The diagnosis of appendicitis without modern diagnostic equipment will be challenging, but we have to remember that medical personnel, in a bygone era, had to depend on the physical signs and symptoms to perform their duties. Hopefully, we will never be placed in a situation where modern medical care is not available. Everyone who expects to be responsible for the medical well-being of their family or group in times of trouble, however, will have to rely on the skills and knowledge they have learned before the tribulations began. Work to get that knowledge and those skills now, and you will have a better chance to succeed, even if everything else fails.